Raleigh has shown its commitment to the sport of cyclocross by upping the ante in its bike selection. With just one cyclocross model for 2011, they now have eight models for 2012, including two with carbon fiber frames, three women's-specific models, and two with steel frames. 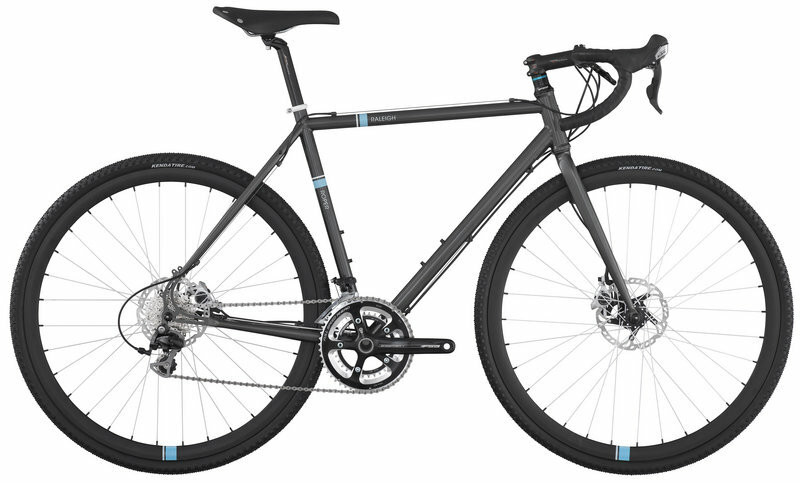 The flagship of the steel lineup is the 2012 Raleigh Roper. It features a 4130 chromoly steel frame and fork. The 20-speed drivetrain centers around Shimano 105 shifters and derailers, and an FSA Gossamer compact double (50/34) crankset. The real distinguishing feature of this bike, however, is the Shimano R505 mechanical disc brakes. With disc brakes now legal in UCI-sanctioned cyclocross racing, you will see more cyclocross bikes with disc brakes in the coming years. Raleigh placed the Roper's rear disc caliper on the chainstay, rather than the seatstay of the frame like most disc brakes. What this means is that the disc caliper is out of the way, allowing the use of just about any standard rear cargo rack and fender, with mounting hassles minimized. UrbanVelo magazine recently did an extensive test and review of the Raleigh Roper; you can read it here. The rider Brad was impressed, and summed the bike up as "a $1500 disc brake equipped steel cyclocross bike meant for the serious commuter or abusive all-day rider that is more interested in the miles." The Roper uses the same frame geometry as Raleigh's lighter and more race-oriented RX series, which Brad says, "[Makes] it a relatively aggressive, fast riding machine. Over a couple of months of riding hitting paved roads and railroad ballast, gravel paths and full-on singletrack, I fell in love with the handling." With friendliness to racks and fenders, we think the Roper would make a perfect commuter or long-distance touring bike, especially if your adventures often take you off the pavement and onto the path less traveled. We've got it in stock in 53cm, 55cm, 57cm, and 59cm. Call us to verify store availability at the Century Cycles nearest to you. If singlespeeding is more your thing, the bike is also available in a one-gear version for $820, named the Furley. The frame is identical to the Roper, including a derailer hanger should you decide to add gears later. Roper and Furley. Come and knock on our door; we've got a 'cross bike waiting for you. It's Winterriffic on January 8! Last Minute Gift Ideas - All on Sale! Take our poll: What do you want Santa to bring? Holiday Fun: Christmas in Peninsula & More!